As I've got so much to catch up on, so I thought I'd do a double post today! If you read my earlier post, you'll know I've been jetting off across Europe over the last few weeks, so my blogging patterns have been very slow! But that's enough of my rambling.. Recently, I was kindly invited to join the OASAP bloggers community. 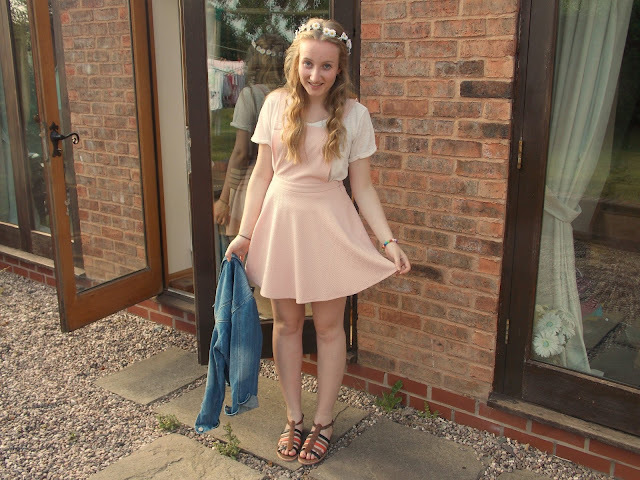 After finding out about OASAP - which sells quality high street fashion - from a fellow blogger, I fell in love with the stores style. In today's outfit post, I'll be talking you through the gorgeous denim jacket, that was sent from the lovely people at OASAP and hopefully convincing you to head over to check out the website for yourself! Because it was such a lovely day, I chose to wear this pink pinafore from New Look, that was only £8.00 in the sale. Pinafores are really popular at the moment, especially denim ones, but this cotton one is great, as it doesn't restrict you. It's a great wardrobe piece for summer, as you can dress it up/down easily. I've worn it with a white over sized tee from H&M, which is also a great item to have tucked in your wardrobe. My sandals were a steal from the Clarks sale (my recent weakness for top quality shoes) and I'm sure you'll see LOTS more of them in the future.. The denim jacket from OASAP was $43 and I was so excited to be buying something from overseas! I felt very American wearing my jacket (weird I know..). Its a great quality jacket, which fastens with buttons up the front, and rolled sleeves - making it more suitable for summer nights! You can wear it with pretty much everything, so it's a great cover up in evenings, if you're trying to squeeze everything into your suitcase! The colour is washed and has a slightly worn style, and it fits lovely. I was really impressed with the OASAP website service, as I don't usually buy items from abroad, but it was worthwhile, as P&P was free and it took less than 10 days to arrive! You can get the jacket here: at OASAP.com. 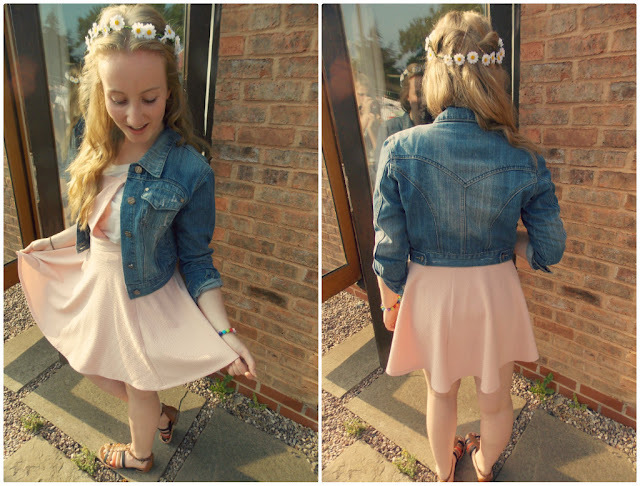 What I'm wearing: Top - H&M, Pinafore Dress - New Look, Sandals - Clarks, Jacket - OASAP, Head Band - Primark. Well that's all from me! I hope you're all soaking up lots of sun (and not getting burnt.). As you can see, I'm always an 'bilk bottle' as my dad puts it, so I'll be reviewing lots of fake tan in the next few weeks! You look so pretty! 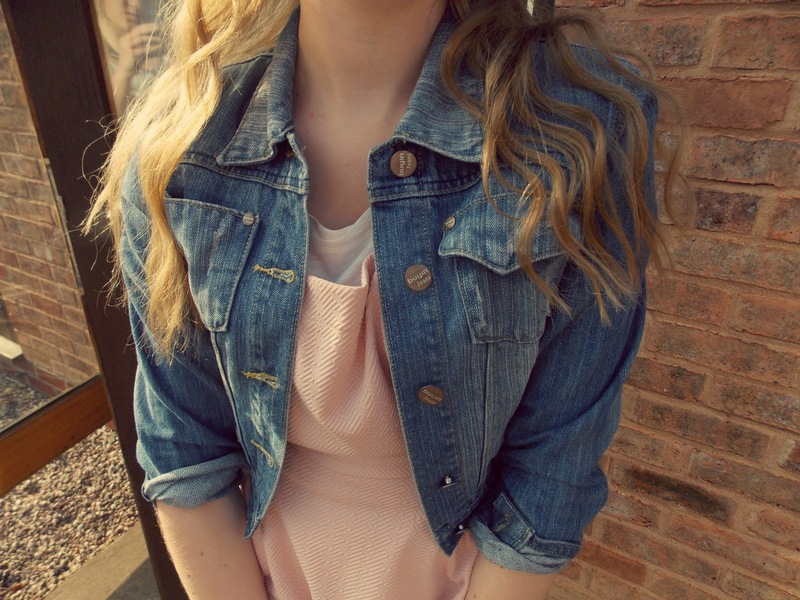 I love how you've paired that denim jacket with a pretty pink dress! 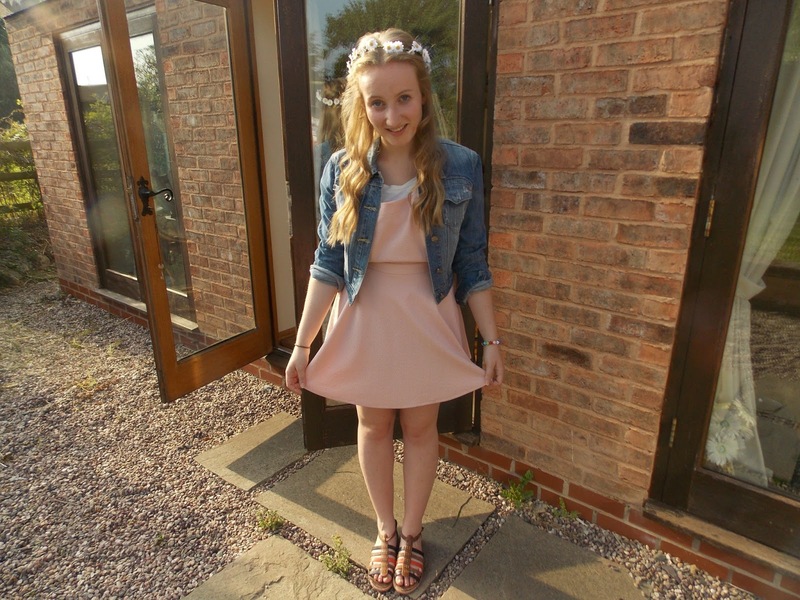 Adorable outfit, peach looks great on you :) Love your sandals! 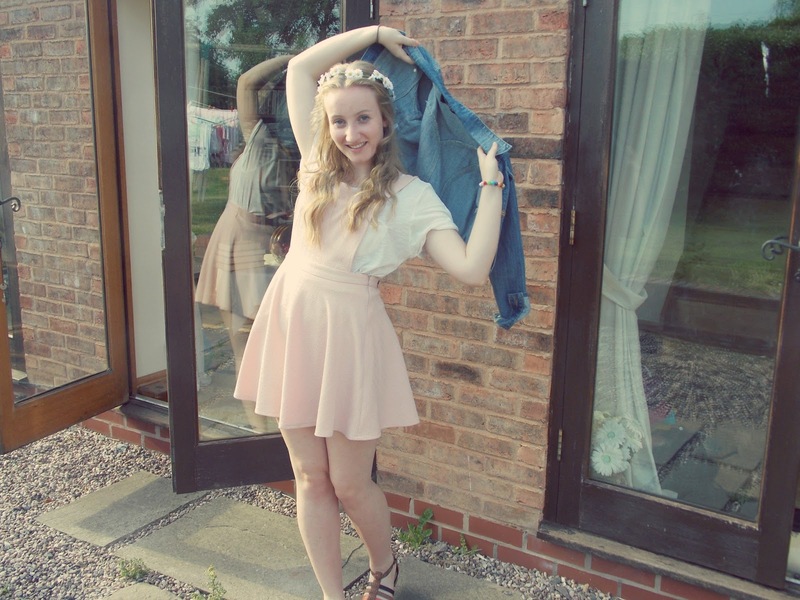 You look lovely, like a fairy. Thanks for visiting my blog and leaving a comment. I follow you via gfc.